In the third week of February 2014, I did something that has never before been attempted in local government anywhere in the world. Using the Google Ventures design sprint format, and a hyper-transparent approach to service design, we drafted a regulatory town plan in just five days. The whole event unfolded on Facebook, and you can still check out the page for the Kamo Place Race to see how it went. What you are not able to see on that page is what the experience was like for the small council team that was heading into the complete unknown. I have shown this story to a few other local government innovators before, and every one of them has said this was exactly their experience as well. The team had come up with lots of innovative ideas before, but it was the politicians who ultimately decided what happens. No matter how hard they tried, they could not find the silent majority. But many people were wary of innovation and preferred tried-and-tested methods. Meanwhile, central government was plotting to take more control, and the situation was becoming intolerable for Rick. Then Rick heard about an event called a Startup Weekend. This event introduced Rick to the agile and lean methodologies from the tech entrepreneur community. Rick got together with the organiser of the Startup Weekend to hatch a plan. Rather than Council trying to “sell” a plan to the community, the team decided they should instead be providing solutions to the customers’ problems. By changing it from a process into a live event, town planning might even be exciting! Rick’s boss thought it ticked all the boxes. The GM didn’t exactly leap at the idea, but instead deferred the decision to the department heads. 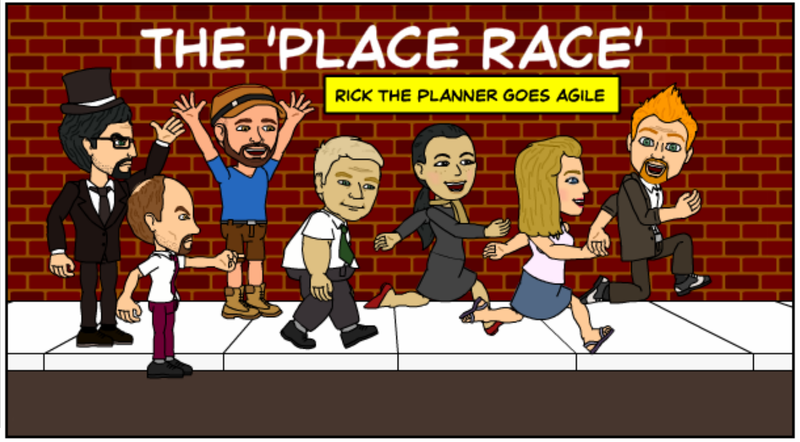 By now it was getting pretty close to Christmas so it was pretty hard to find a time that suited all the managers, but Rick’s perseverance paid off and the race began. The team immediately got to work setting up the social media, putting up posters around town, and generally getting out among the community. As the event drew nearer it became more difficult for the planners to “unlearn” how to plan and trust that the process would adapt. So the team started posing questions to the community and let the level of interest drive the conversation topic. Word was spreading fast and some people were starting to get nervous. Facebook page visits were growing, and the crowdsourcing potential was huge. Surveys were prepared in advance, and would include face-to-face interviews with visitors. It was now race week, and the planning team were getting to know all about the community, what their needs were, and what was important to them. It took some people a bit longer than others to join the conversation. Overall the community were fairly consistent in their views. While the planners crashed out a plan change for the final presentation, the rest of the team built a pop-up park. The team had pulled it off. They were feeling great, and keen to start another. The community was also buzzing, and were taking up their own initiatives. But where were all the practitioners? And when the existing power balance is disrupted, those that currently hold the power will not be happy, and you can expect them to push back. What can we learn from this story. Draft (beta) versions of regulatory documents actually lower risk by lowering expectations. Trust the community with your information and knowledge and they will trust you back. Shifting responsibility and power will have a push back response from those who currently hold it. But, empower staff to use their initiative and you WILL get innovation. The choice is up to all of us.